That’s right, beer-muda. As in outstanding hand-crafted microbrew beer, to be found in Yolo County’s three principal cities of Davis, Woodland, and Winters. You can drive or, better yet, bicycle your way from one location to the next, savoring your favorite suds as you go. 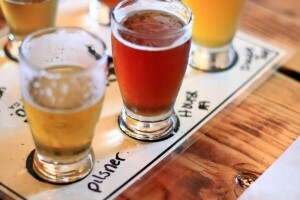 Start in Davis at Sudwerk Restaurant & Brewery, one of the most popular and successful microbrew operations in Northern California. Sudwerk produces award-winning Pilsner, Marzen, Hefe Weizen, and Lager, as well as a changing lineup of seasonal brews such as Oatmeal Stout, their signature IPA, Mai Bock, and Dunkel Weizen. Step next door to the Sudwerk Dock Store, where there is always something new and interesting on tap. Next head north a mere dozen miles to Black Dragon Brewery, a truly inventive company in Woodland making lovely ales, hoppy IPAs, and lush Porters among other offerings. Black Dragon also sells soft pretzels, sliders, and a tasty “Wanderer’s Lunch” with cheeses, salami, and fresh fruit. Then stop off at the newly opened Blue Note Brewing Company in Downtown Woodland. Blue Note has a 6-barrel system using only 100-percent grains and has eight beers on tap. A local fav is the raspberry wheat made with fresh fruit. To the southwest on the outskirts of Winters, you’ll find Berryessa Brewing Company, just a year old but already a hugely popular destination, with its cozy taproom and country setting. 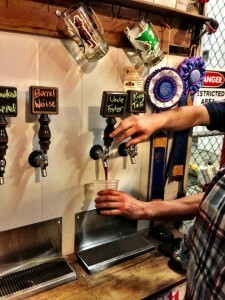 Here sample such delights as deep Baltic Porter, Amber Freshie, lighly floral Common Sense, and Double Tap IPA. All Berryessa beers are unfiltered, naturally carbonated and delicious. The Beer-Muda Triangle: a great place to get lost!